Survivor: One World (2012) - Winner, 7-2-0. Received 7 jury votes to win in Episode 14, "Perception Is Not Always Reality" (Day 39). One World Ep. 3 RC: "Shut Your Trap"- Kim doesn't get a turn, but Salani sweeps Manono, 5-0. One World Ep. 4 RC: "Coco Connection" - Salani wins, Kim contributes one hit of the grid. One World Ep. 7 RC: "Sea Turtles" - Kim is part of losing team (with Kat, Tarzan, Jonas, Mike, Leif). One World Ep. 8 RC: "7UP" - Part of winning team (with Leif, Mike, Christina, Sabrina). One World Ep. 9 RC: "DIY Ladder Tree Golf" - part of losing team (with Leif, Chelsea, Christina, Sabrina). One World Ep. 7 IC: "Roller Ball" - Out in second round (of three; 8th/12). One World Ep. 8 IC: "Odd Shaped Bottoms" - Makes final round, but just loses to Jay (2nd/11). One World Ep. 9 IC: "When It Rains, It Pours" - Drops out very early for cupcakes (6th/10). One World Ep. 10 IC: "Return from the Dead" - Narrowly misses 3rd and final round (3rd/9). One World Ep. 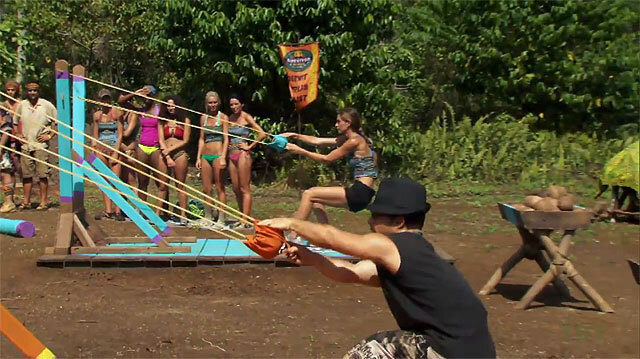 11 IC: "Slip Sliding Away" - Kim wins her first immunity necklace (1st/8). One World Ep. 12 RC: "Connecting With Loved Ones" - Narrowly loses to Kat, goes on reward anyway (2nd/7). One World Ep. 12 IC: "I Hold On" - Kim wins immunity again (two straight, 1st/7). One World Ep. 13 RC: "Spinning Wheel" - Loses to Chelsea, gets taken on reward again (2nd/6). One World Ep. 13 IC: "Bone to Pick" - Barely loses to Alicia (2nd/6). One World Ep. 14 F5 IC: "Balance Beam Maze" - Kim wins (1st/5). One World Ep. 14 F4 IC: "Operation Balance Build" - Kim wins again (1st/4). One World, Ep. 5: Finds Salani's idol, hides it, but never plays it. One World, Ep. 9: Jay Byars (voted out, 5-2-1-). One World, Ep. 9: One vote, from Troyzan. One World, Ep. 10: Two votes, from Troyzan and Leif. One World, Ep. 14: Received seven votes, from Jonas Otsuji, Michael Jefferson, Jay Byars, Kat Edorsson, 'Tarzan' Smith, Alicia Rosa, and Christina Cha (and won, 7-2-0). Gordon Holmes at XfinityTV.com (5/14/12): "Survivor: One World Winner Interview: Kim Spradlin"
Rob & Nicole Cesternino at RobHasAPodcast (5/14/12): "Kim and the Gang: Interviews with The Survivor: One World Final Five"
Lindsay Silberman at TVGuide.com (5/14/12): "Survivor: One World Winner Kim Spradlin Explains Why She Thought She Didn't Have a Chance"
Josh Wigler at MTV.com (5/14/12): "Survivor: One World Winner: 'I Got Lucky'"
Daniel Fienberg at HitFix.com (5/17/12): "Kim Spradlin talks Survivor: One World"
"Kimberly says: I was hoping I would look like a bridal owner and not tell anyone I used to be a whitewater rafting and outdoor adventure guide. I don't want to fly under the radar. I want to go big. Jeff says: Kimberly is another favorite to win. If she can get to the end, she'll win the money. She's likeable and smart enough to stay out of the way." "Personal Claim to Fame: Always being up for adventure! Opening my own business at age 26, working as a whitewater rafting guide, living at an orphanage in Thailand… Oh! And I can figure out what animal a person would be within five minutes of meeting them. Pet Peeves: Speed bumps, corny humor, people who honk to reprimand rather than as a warning, and really bad bridesmaid dresses (there's no reason for that, really). Survivor Contestant You Are Most Like: Probably Stephenie LaGrossa from Palau, because she's a badass (total honey badger). Also, Elisabeth Hasselbeck because she was friendly but competitive and Amanda because she is tall. Reason for Being on Survivor: Truly for the thrill of it! Stepping away from the comfort of my little world and challenging myself. Proving I can do as well at this game as I've always thought I could. Why You Think You'll "Survive" Survivor: My mental toughness, wicked throwing arm (for a girl), and people sometimes underestimate my sneakiness. Why You Think You Will Be the Sole Survivor: I believe in treating all people with respect and honor. Why would you vote off someone who respects you?"